Rangers striker Calum Gallagher is one of three new faces at Cowdenbeath. Cowdenbeath have confirmed the signings of Calum Gallagher, Anthony Higgins and Pat Scullion. 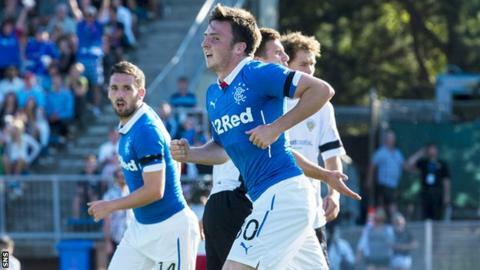 Gallagher, 19, has joined on loan until January from Rangers. Higgins, 18, is the young brother of Blue Brazil striker Sean and has signed a short-term deal until January after impressing on trial. Scullion, 27, returns to Central Park from Clyde for a second spell after being part of the 2006 Third Division championship winning side. He scored seven times in 77 games for Cowdenbeath before moving to Alloa in 2008. Ex-Tottenham striker Kudus Oyenuga joined on loan from Dundee United last week.